Return dates on library materials vary, depending on the item you have checked out. Books and audio books are checked out for three weeks with an option to renew one time. Fines on three week items will be ten cents per item each day they are overdue. You are allowed a grace period of eight days. Overdue notices are mailed as a courtesy. If items are not returned, you will be billed and receive a letter from the County Attorney. Magazines are checked out for one week. The same return policy does apply. Videocassettes and DVDs circulate for three days and may not be renewed. The charge for late videos and DVDs is fifty cents per day, per item. You may return an item to any Harnett County library; it will be returned to us through the courier service. If you wish to renew materials, excluding videos and DVDs call 897-5780 during regular business hours. We offer services to the Community such as copies and fax services. Interlibrary loan, voter registration forms which are mailed directly to the Board of Elections. 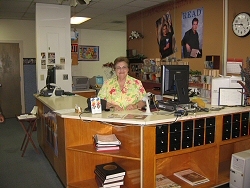 The Erwin Library offers tax help from highly qualified CPAs during tax season. You must make an appointment as they only work at our library one day a week.